Editorial Update: I have since come across complaints from numerous customers about this company. As many are regarding funds being unnecessarily held for extended periods of time, I am not comfortable recommending PayAnywhere. I addressed these complaints with someone from that company and was told those issues were not a concern to me. There are similar complaints extending all the way back to early 2012. So please do sufficient research before committing to a company for something so important to your business. As you know, long gone are days of cumbersome credit card sliders stamping paper copies for vendors and buyers. As we keep moving forward the large, stationary credit card readers bolted onto countertops are also becoming a thing of the past. If you are a business owner or merchant looking to find a quick and nimble way to process credit cards, you’ll want to check out mobile readers and apps. There are numerous credit card reader and app companies out there. Today, we want to break down the soft and hardware that Payanywhere delivers. What’s the upside of PayAnywhere credit card readers? What’s the downside of PayAnywhere credit card readers? The extra cost of a PayAnwhere reader is zero. But that does assume you have a modern “smart” device such as an iPhone or compatible tablet. If you are going to personally be processing these payments, then it is simple to do this on your own phone or device. If you are going to have employees processing these payments, it’s likely you’ll need to fork out the cash for a device rather than being liable for your employees personal device. PayAnywhere’s cost to you is simply charging you per swipe—at 2.69% per. So how does PayAnywhere stack against the market it’s entering? The below graphic is from PayAnywhere’s website. They don’t list who they are comparing their pricing against, but I found it to be Square which is a leader in marketshare. PayAnywhere’s per swipe fee isn’t significantly lower (2.69% vs. 2.75%), but Square has significantly higher entrance fees to get the hardware compared to PayAnywhere’s free headphone slot plug-in. PayAnywhere charges 3.49% + plus 19 cents for keyed-in / typed transactions. Nope. There are no monthly fees or minimums. Expect to receive funds within 2 business days of processing. It is not hard to find the support number on PayAnywhere’s website. It’s right there on top. Whereas with other company’s customer service departments, you might have to dig around to find a number or enter a trouble ticket first. This allows you to reach out to a person right away rather than getting onto a computer first and going through a series of steps. Viewing transaction details is a piece of cake, such as the sale amount, tax, discount, and even tip. You can also see graphs of your top sales days, produce a variety of custom reports, and set it up to send reports to you via email automatically. 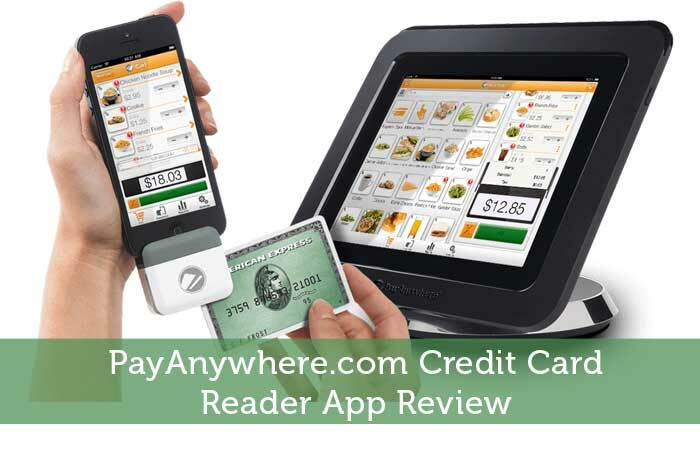 Should you try the PayAnwhere reader and app? If you own a business, you should absolute try making an account to access their services. It’s free. And it’s quality. Who can complain about free, quality things? If you don’t like it, there’s no cancellation fee. All you have to do is sign up at PayAnywhere and they’ll mail you the reader for free with no obligation. This is just another one in the large list of mobile payment processors. Square and Paypal’s solution are the biggest, but it is always good to see more competition. Competition is definitely good to see. I’d hate to see paypal develop a monopoly on mobile credit card processing too. I’ve heard of Square from my friends but haven’t had a chance to use it – any good, Grayson? I am a user of PayPal, though. My mom uses it for her business and I have tried it out before. Super easy to use and does what Paypal does. Square came out first, followed by Paypal’s mobile processor. I am so glad you write reviews of websites/apps I already use and have never heard of, Todd. I always love and enjoy reading them. Sometimes there’s a reason you haven’t heard of an app though. Refer to my editorial comment that I added to the post. I agree with Grayson. Competition is always a good thing in this field. I still remember working in retail many moons ago when you imprinted a credit card on carbon paper. Yikes! I’m glad technology has made that a thing of the past! I worked in retail back then too. Credit card processing sure has come a long way since then. Back in those days people actually had to look at the signature on the back of your card. This is actually pretty interesting technology. I don’t understand why anyone would pay 2.69% additionally, because then the credit card company also charges the company. I do think it’s good for people who work outside of an office (ie personal trainers). See the name I created, Daisy, says it all. The individual that uses this IS essentially the “business” you speak of. Are you high? Stay away from Pay Amywhere, they are a ridiculous and crooked company. They are currently holding over $5k from me which they say I will receive in 90 days! The first couple of small transactions were processed and deposited to my account. Then after a busy period of sales they just held onto my money with no notice whatsoever. I was asked to produce 3 months bank statements to rectify this problem which I did. After being transferred and given the run around by extremely rude staff, I received an email saying my account was being closed and funds held for 90 days. They have absolutely no grounds for this, I have been in business selling my products for many years prior to this. Furthermore I have read of other users accounts being treated the same and then not receiving there funds after this ’90 day hold’. I am now in the process of lawyers looking at this case for me. I really wish I had seen reviews such as this prior to signing up. If you just go by reviews on the App Store then somehow they seem to maintain a high user rating. Do not be fooled by this like I was, you will be sorry you ever used them. Steer well clear of this company! So John…who do you use for your credit card business now? PayAnywhere has been currently been holding my funds from a transaction over that took place over 2 weeks ago. I’ve called a handful of times and was told a supervisor would call me back, which never happened. They also wanted my bank statements, which really isn’t necessary anyway, since they never deposited the funds. So after waiting for a call back after the supervisor was supposed to do some “research” on the transaction, I called again, and was told that my account has been closed! I never authorized this and was told that it was closed on the same day that I called to look for my funds. So no call back, no funds deposited, no reason given for any of this, and now my account is closed. Thankfully, I haven’t made any more transactions, because I didn’t want to trust that those would go into my account, when the other hadn’t. But I’ve been using this company for 2 years now, and I don’t understand why they are doing this now. I didn’t realize this was going on with other merchants. I think a Class Action Lawsuit is in order! Who’s with me?! This company is a joke! Tried to use them almost a year ago they had problems processing flex spending cards. Turn over time concerning approved transactions on regular cards exceeded 24 hours some took up to 48 hours. I finally gave up due to the constant issues. As of 6.10.2014 this company still needs to get its act together. I recently made a transaction through pay anywhere. The transaction was approved by the card holders company. I received an email from pay anywhere requesting a copy of the invoice showing the money due from my client. This was done and a call was made to pay anywhere. I was then told I needed to provide more information and they were holding the approved funds until I provided them with 3 months of my business bank statements in case there was a charge back. Never has any processing company ever asked me to do such a thing. Understanding their point only if the funds were being held up by my clients card company. I was told pay anywhere has the funds. To me if pay anywhere has my money in their account from my client for services my company provided these funds should be released. I’ve since refunded my clients card which will take 7-10 days. Being a small business I’d advise anyone using this service to run! I will be using another card processor. Avoid this company. They will screw up your credit processing then charge you for their mistakes. On Jan 21st 2015 I processed two charges. The money was NEVER deposited to my bank and after a number of days and exchanges of emails I was told the funds were “on hold” pending an audit and verification. I was told the customers would be contacted to verify the validity of the charges. My customers informed me no one ever made such attempt. In a phone call I was told to have my customers call Pay Anywhere and given a phone and extension for a Tara. When one customer attempted to call they were told they could not proceed without providing their merchant number. My customers don’t have a merchant number as they are not the merchant but the card holders. Since I needed to fulfill my customer’s orders I needed to have the funds in order to pay my supplier before they would ship. My customers were becoming impatient with me due to the delays by Pay Anywhere withholding funds. In order to avoid losing customers because I was unable to fulfill their orders on time it was necessary to refund their charges and collect via another method. Last week Pay Anywhere debited my company account for $36.50 and claim it was for the transaction fees plus an additional fee for the refund. I repeat, NO FUNDS were ever deposited in my account and they never followed through on verification so there WAS NO COMPETED TRANSACTION. I would not trust this company with my business and terminated my account. They wanted to charge me for their failure.